LAPD Summer Carnival Street Closures Start Tomorrow! - Yo! Venice! Home Venice Beach California LAPD Summer Carnival Street Closures Start Tomorrow! LAPD Summer Carnival Street Closures Start Tomorrow! 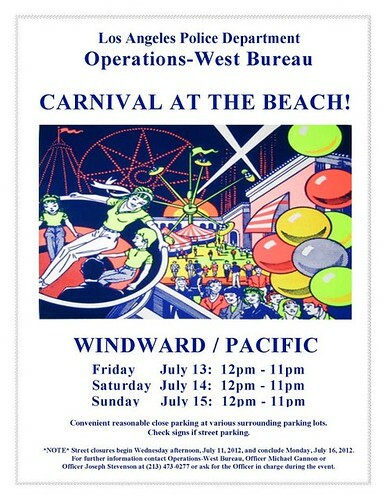 The LAPD West Bureau Summer Carnival will take place Friday, July 13 through Sunday, July 15 at the corner of Windward and Pacific Aves. Street closures in the area will begin Wednesday, July 11. This is the first time the annual carnival, which is in its third year, will be held in the Venice area. The carnival runs from Noon-11:00pm each day, and is focused on attracting Venice residents and visitors who are already in Venice Beach – young children and families in particular. Mechanical rides and games will be set up, and LAPD officers will be on hand to interact and meet with attendees. The Bureau estimates that attendance could be as high as 15,000 people per day. Pacific Avenue, Venice Way and Venice Blvd. will ALL remain open in BOTH directions. Residents are encouraged to walk or ride their bikes when possible.